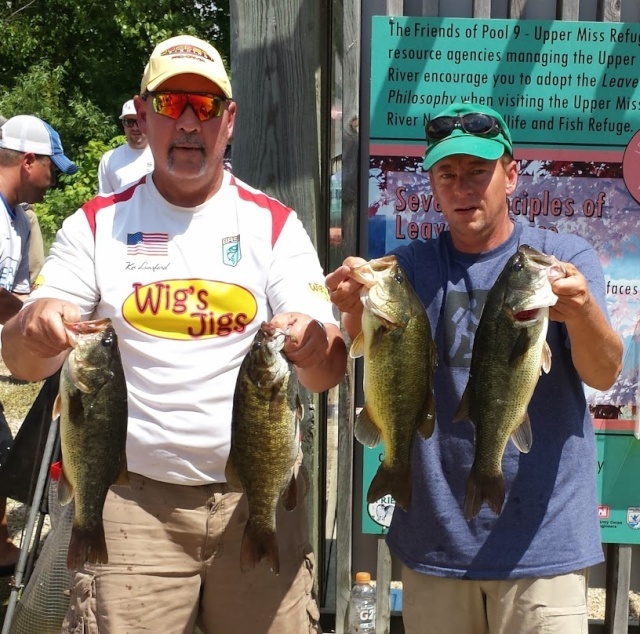 Pool 9 of the Mississippi River was the conclusion to the 2014 Hot Rod Baits Series. The river was high, and flowing swiftly, but the bite was HOT! The mighty Mississippi River did not dissapoint as almost every team came in with a limit of 6 bass. Ken Lunsford and substitute Jimmy Gaard found enough bass to take the Pool 9 title, congrats to them! Full details and Team of the Year standings can be seen on the 2014 Results page. This Sunday the final event of the year will take place on the famed Mississippi River at Pool 9. The top two teams from the year-end standings will take home a combined $700, along with the regular purse payout for this event which is up for grabs. Numerous teams have a chance at the extra prize money, and they will casting until the last second to catch it. Tom Cranston and David Markham bested the field of 19 teams to take the title by almost a pound. Their 6 bass limit weighed 17.95#. Congratulations to them on their first Hot Rod Baits Bass Series victory! June 1st marks stop #2 on the Hot Rod Baits Bass Series. 5:30am-1:30pm will be the tournament hours. 19 teams are set to battle it out! Hot Rod Baits just keeps catching the big ones this spring. A nice 3-bass limit of fish all caught on Hot Rod Baits from a recent evening tournament. 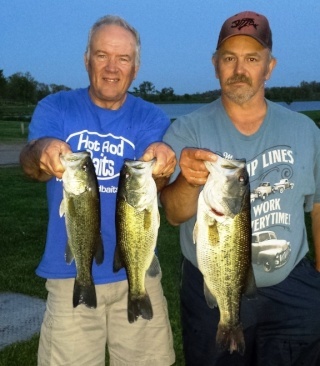 Denny Meyer and Dave Dost both reported catching their limit on Hot Rod baits Big Craws and Tubes. Hot Rod Baits has released a new color of jig chunk for 2014. 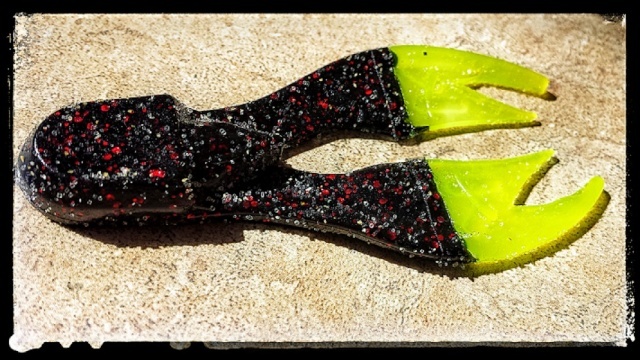 The Black/Red flake with chartruese tips will let any bass see this bait in dirty water. This jig chunk is 3.25 inches and a must for any water with that dirty brown tint that many lakes and rivers turn to in the spring. Get yours today!